Is there an easy way to move an object from one class or layer to another? You don't need to cut and paste in order to move objects from one class or layer to another class or layer. There is a more practical way. First, select the object you want to move. 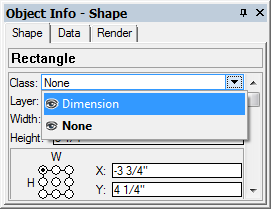 Then, go to the Object Info Palette and select the desired class or layer from the Class and Layer drop down boxes at the top. The selected object is now assigned to the new class.